On the 10th January 2018, a group of 23 Flamsteed members successfully negotiated the “get out of London” rush hour traffic to visit the Bayfordbury Observatory near Hertford, Hertfordshire. The Bayfordbury Observatory is the University of Hertfordshire’s teaching observatory for astronomy and astrophysics and is regarded as one of the finest astronomical teaching observatories in the country. It is equipped with 7 large optical telescopes, a high definition planetarium and, of particular interest to the radio astronomers in the group, 4 radio telescopes including a radio interferometer. 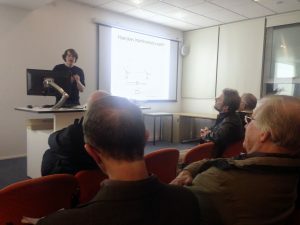 Our visit started with a talk on radio interferometry given by Jonathan Westcott, a postgraduate radio astronomer, who described the advantages of observing the universe at radio wavelengths. Jonathan went on to explain the basic principles of the technique, and how it can be used to synthesize the huge apertures necessary to study the universe in fine detail at radio wavelengths. Perhaps a difficult subject to get across to a non-specialist audience, but judging by the number and quality of the questions from our members, on the whole, I think he succeeded. Sadly, the faint possibility of a clear sky wasn’t realised and our lust for starlight had to be satisfied by a trip around the solar system and beyond courtesy of the observatory’s small but impressive planetarium and an enthusiastic commentary given by our guide Lord Dover, an MSc student at the observatory. 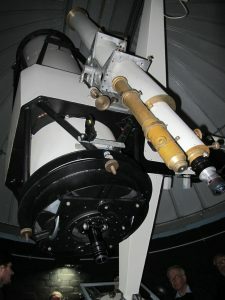 The JCD Marsh Telescope, a 20-inch f/13 Cassegrain on an English Cross-Axis mount. Originally built as a 16-inch Cassegrain/Newtonian it was later modified to take the larger 20-inch mirror. This telescope is used as a simple platform for introducing students to astronomy, allowing them to move the telescope and observe the skies directly through an eyepiece. The Chris Kitchen Telescope, a 16-inch Mead LX200GPS fitted with an SBIC STL-6303E camera and a 5-position filter wheel equipped with BVR photometric and H-alpha filters. 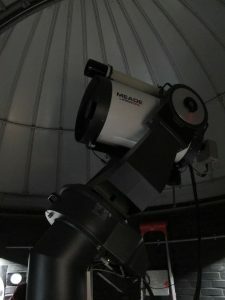 This telescope’ along with several of the others on the site, is configured to run robotically, allowing automated observations of the night sky. As well as acting as teaching aids, the research carried out using these telescopes includes; a sky survey to find exoplanets, an investigation into the physics and chemistry of exoplanetary atmospheres by monitoring exoplanet transits of bright M-dwarf stars. Unfortunately for the radio astronomers in the group, the Radio Interferometer was out of commission awaiting an upgrade to the telescope’s receivers. This telescope comprises two 3m dish antennas on a baseline allowing a separation of up to 115m. It operates at the 1.4GHz (21cm) Hydrogen line frequency. The telescope is mainly used as a teaching aid. We were also shown the 4.5m dish of the R.W. Forrest Radio Telescope. Mounted on an alt-az mount this dish is steerable and also operates at a frequency of 1.4GHz. My thanks to our hosts at Bayfordbury Observatory, to Christina Chester for suggesting the visit, to Mike Meynell for organising the collection of the entry fees and to Christina and Thomas Morris for supplying a number of the photographs used in this report.